One of the many flooring options we offer at 2 Day Flooring is laminate flooring. You’ve probably heard of this type of flooring since it is very well known and popular in family homes. For those of you who have children or animals, you’ve probably dabbled with the idea of laminate flooring being installed in your living room or in the hallways because it’s great for high traffic areas. In addition, there are many benefits to laminate flooring, which we’ll dive into in our blog post today. While it’s easier to clean than hardwood flooring, laminate flooring is also great for homes that occupy small children and/or animals due to the scratch-resistant and stain-resistant surface. 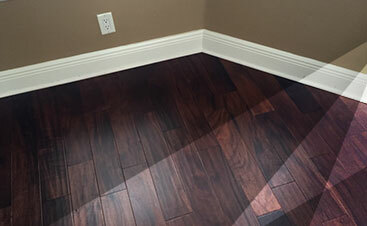 At 2 Day Flooring, we offer four different types of flooring options: hardwood, vinyl, laminate, and tile. We sell a variety of different flooring brands as well and if you don’t know what to choose, then our experts will help you during the process when it comes to your final decision. We want to make sure that you’re happy with your flooring, and that means offering you the most information possible on the options you’re interested in. For further information about laminate or another option we offer, take the time to contact us. Additionally, we’ll also check in with you to make sure your experience was a good one with our experience survey. We strive to ensure every customer who comes to us is well cared for and has a good experience with us since we’re constantly trying to better ourselves. We’re 100 percent dedicated to ensuring you’re happy with your floor. 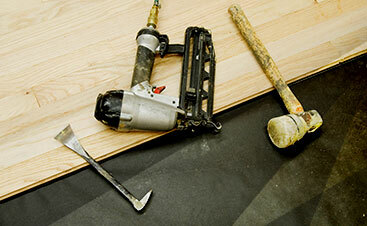 Once upon a time, laminate flooring used to be a cheap, disposable, and plastic-made option. Now, laminate flooring is a beautifully-made, advanced, and durable option for any home. Laminate flooring is more affordable than most options as well. If you adore hardwood flooring, but you know you can’t afford it or you have small children and animals that you don’t want to ruin the crisp, gorgeous wood, then laminate flooring is a perfect option for your home. Available in a variety of types, laminate flooring can be a great choice for the family that wants gorgeous flooring without having to worry about cleaning and maintaining it consistently. 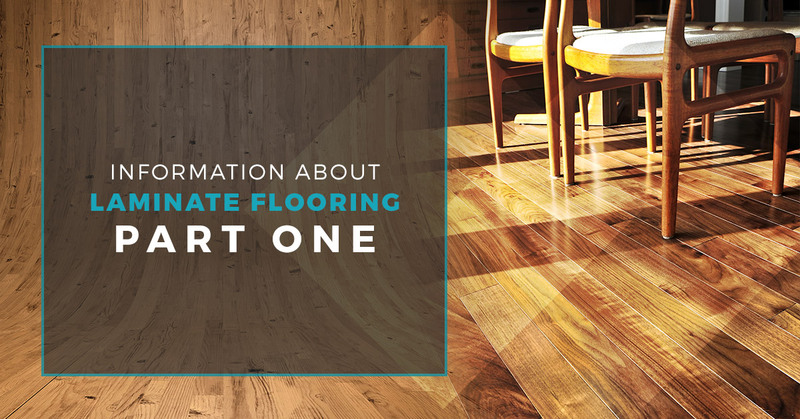 To help you better understand laminate flooring, we’re going to go over the process for it. Laminate flooring is made up of four components, each of which are very basic. There is the backing layer, the core, the material that it should resemble, and finally, the top layer. The backing layer is for support of the floor planks to create stability. The core is for high density to add additional moisture to the board and ensure that its sturdy. The next layer is for the look of the plank. For instance, it might resemble wood grain, ceramic tile, or a stone pattern. The top layer is protection for the wear and tear. This portion is the most durable to ensure that nothing harms the wood. On the top layer, there is aluminum oxide particles or melamine resin to create extra durability and moisture to protect the flooring plank. Laminate flooring is a beneficial choice for most homes. It’s a great option for those families that need an extra layer of durability on the floor. It’s for the family that has a few furry friends and wants to maintain the look of their floor. And it’s for the family that has a few young children that enjoy playing on the floor and perhaps occasionally drawing. Laminate flooring is a beneficial choice because of the stain-resistant and scratch-resistant surfaces. It’s also a beneficial option due to the pricing. It’s an affordable flooring choice, that looks fantastic and realistic. Instead of purchasing hardwood flooring, you can choose laminate flooring that looks exactly the same but requires less maintenance. In addition, you never have to worry about picking a laminate flooring plank for your home that looks less than perfect. With the wide variety to pick from, you might even have to ask an expert for the best option of laminate flooring brands because there is such a selection. From the style to the design, you can benefit a lot from this option. Furthermore, laminate flooring is beneficial because it’s sturdy and you don’t have to worry about something happening to your floors. On a rainy day, you don’t have to take your shoes off immediately nor do you need to consistently clean the floors. Lastly, and our favorite, laminate flooring doesn’t require a lengthy installation process. The procedure is simple, painless efficient, and affordable. So what are you waiting for? Are you ready to consider the rooms you want laminate flooring in?